← Of the three, I loathed two. Seriously, David Lebovitz – I salute you. 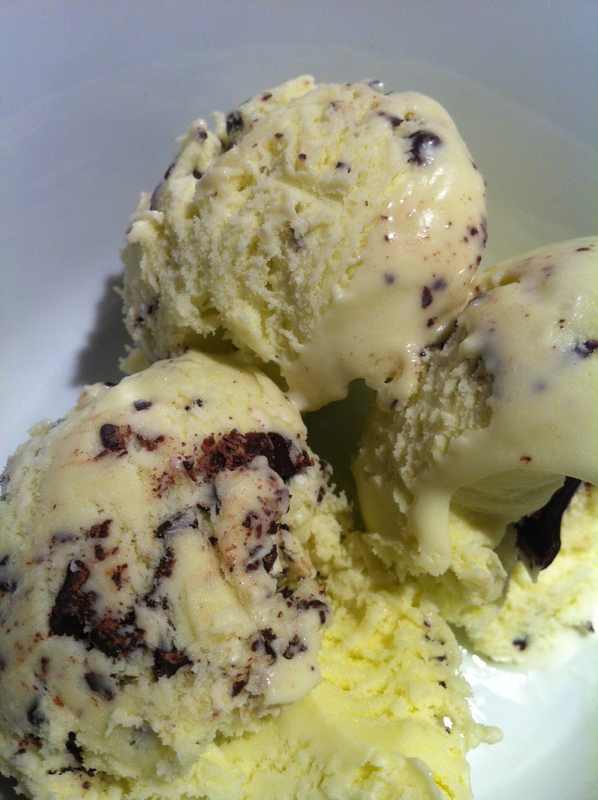 You taught me to temper chocolate, to candy ginger – and now, HUZZAH – to make homemade Mint Chocolate Chip Ice Cream. This week the mint surprised us by just showing up, literally overnight. Before her soccer game this morning, I sent E on a foraging mission. She brought back THREE cups of freshly picked mint leaves, which I steeped in a mixture of cream, milk, salt and sugar. I strained it, reheated it, added in some whisked egg yolks and more cream, then turned everything into a custard base. 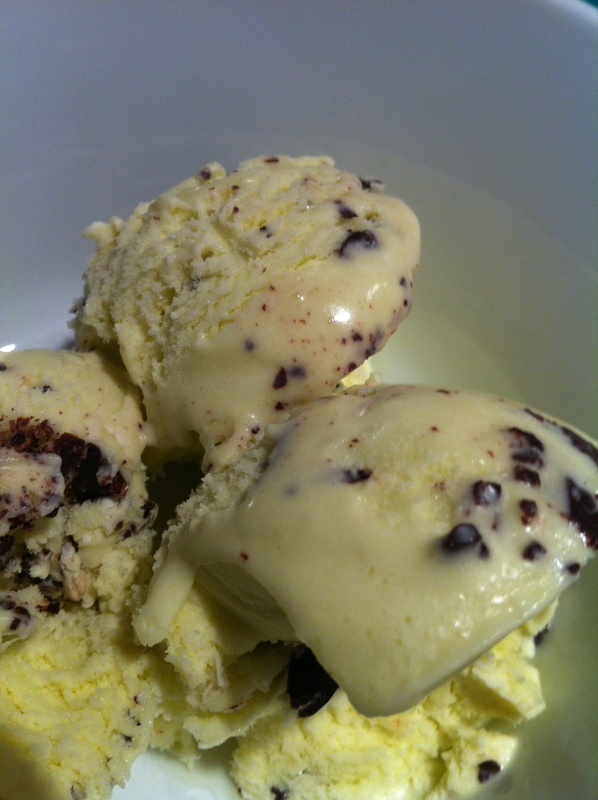 After some cooling action in the fridge, I dumped everything into the ice cream maker and tried not to lick my fingers. I got a little lazy and just melted the chocolate in the microwave. Instead of adding in chips, Señor Lebovitz suggests “scribbling” it in and then breaking it up in between your layers of delicious minty ice cream. I shoved everything back in the freezer to harden and several hours later we pulled it out for dessert tonight. BE FOREWARNED: The ice cream is a rather pale and pretty shade of green, not the expected tedious shade of noxious GREEN that come prepackaged. E looked at the homemade ice cream and asked why I made vanilla. I asked her to taste it and tell me if she thought it was still vanilla. She did a little dance of joy. 5oz. Bittersweet Chocolate, chopped **splurge on the good stuff. THIS is worth it! 1- In a medium saucepan, warm the milk, sugar, 1 cup heavy cream, salt, and mint. 2- Once the mixture is hot and steaming, remove from heat, cover, and let stand for an hour to infuse the mint flavor. 3- Remove the mint with a strainer, then press down with a spatula firmly to extract as much mint flavor and color as possible. (You can also use well-washed hands to do it as well, making sure the mixture isn’t too hot to safely handle.) Once the flavor is squeezed out, discard the mint. 4- Pour the remaining heavy cream into a large bowl and set the strainer over the top. 5- Rewarm the infused milk. In a separate bowl, whisk together the egg yolks, then slowly pour some of the warm mint mixture into the yolks, whisking constantly, then scrape the warmed yolks back into the saucepan. 6- Cook the custard, stirring constantly with a heatproof spatula, until the mixture thickens and coats the spatula. If using an instant read thermometer, it should read around 170ºF (77ºC). 7- Immediately strain the mixture into the cream, then stir the mixture over an ice bath until cool. 8- Refrigerate the mixture thoroughly, preferably overnight (**I think I had mine chilling for 3+ hours), then freeze it in your ice cream maker according to the manufacturer’s instructions. 9- While the mixture is freezing, melt the chocolate in a small bowl over a pot of simmering water, or in a microwave oven on low power, stirring until smooth. Place a storage container in the freezer. **I put my container in the freezer yesterday to ensure it’d get cold enough. 10- When the ice cream in the machine is ready, scribble some of the chocolate into the container, then add a layer of the just-churned ice cream to the container. Scribble melted chocolate over the top of the ice cream, then quickly stir it in, breaking up the chocolate into irregular pieces. 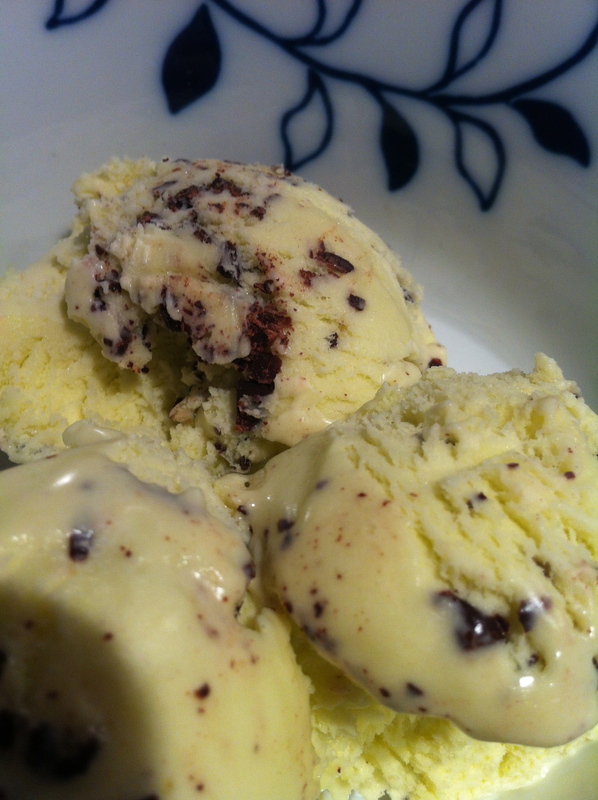 Continue layering the ice cream, scribbling more chocolate and stirring as you go. 11- When finished, cover and freeze until firm. YOU try not to lick the bowl! R is going through a phase right now where she insists that I feed her. When I accidentally put too much ice cream on her spoon I asked her if that was too big of a bite? I’m a whore for mint chocolate ice cream. I admit it. I might have to borrow someones ice cream maker just to make this at home. I just planted mint in the garden last weekend. This makes me happy. I shall do a Happy Dance in your honor! Not tried it as a milk shake…too busy licking my fingers!